The largest ‘Vinex’ development in the Dutch government’s housing programme is taking shape to the west of Utrecht. 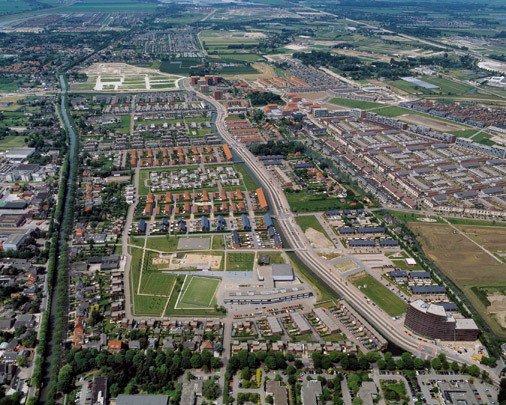 A village, De Meern, and the existing ribbon development are to be assimilated in this satellite town for 90,000 inhabitants on a site the size of Hilversum. Led by supervisor Riek Bakker, four urban design practices have developed the eight sectors of her masterplan. A projected rapid bus service, a new train station and cycleways are to lure residents out of their cars. Sustainable building is another key objective. Three new bridges, including Ben van Berkel’s Prins Clausbrug, stitch Leidsche Rijn to the mother city. See also: WOS 8 by NL Architects, the Exhibition Pavilion by Stanley Brouwn, housing project Scherf 13 by SeARCH, the Community School 't Zand by VenhoevenCS and kindercluster Noord by VMX Architects.